"I have many enemies, but what I need, Zildo, is a Friend. The Divine Friend. The Friend whose beauty shines from body and soul." The writer Frederick Rolfe ("Baron Corvo") was born in London in 1860 and died in Venice in 1913. A complex, cantankerous and contradictory character, Rolfe destroyed friendships with the same intensity he sought to make them. 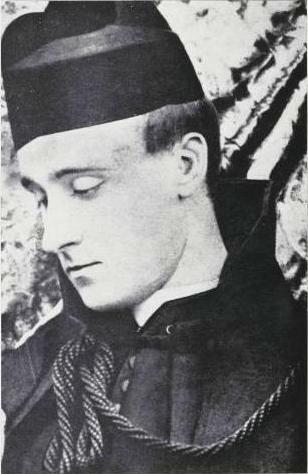 A convert to Catholicism, his greatest ambition was to be a priest, but inability to get on with fellow students, unwillingness to conform and growing debts led to him twice being expelled from seminary. An intensely proud man, Rolfe rejected all charity while living off loans that were seldom repaid. Strongly attracted to handsome young men, he swore celibacy for most of his adult life. A talented author who described writing as a loathsome occupation, his works today are mostly out of print - except for Hadrian The Seventh, in which a man long denied the priesthood is suddenly elected Pope . . .
Martin Foreman's one-man play depicts Rolfe in Venice on the last day of his life, pottering around his room, occasionally addressing his companion-servant, whose presence is felt but never seen. As he looks back on his life, his thoughts both spiritual and carnal, his memories caustic and unforgiving, Rolfe's mind teeters into the fantasy that he is indeed Pope. A powerful and sympathetic portrayal of a talented, troubled individual. Includes a short biography of Rolfe and detailed text notes.